Justice Minister Ayelet Shaked (Jewish Home) responded Monday to claims made by new the Supreme Court president that judicial appointments have become politicized. 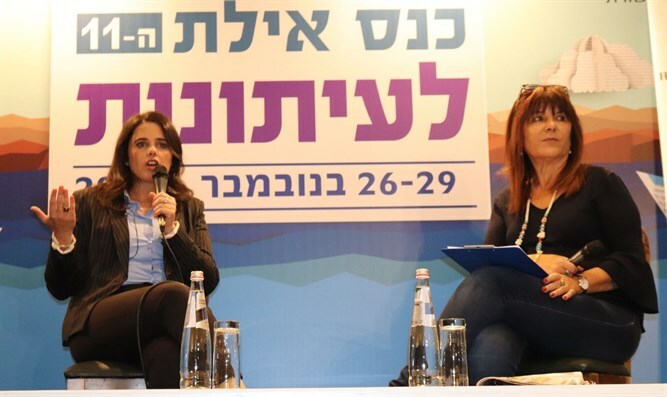 In an interview with journalist Rina Matzliah at the annual Eilat media conference, Shaked said that during the past two years, 230 judges had been appointed. All proved to be successful and outstanding jurists. "When I entered the Committee, I told myself I wasn't going to be there for decorative purposes but to have influence, and I forged legitimate and useful partnerships. We meet and cooperate with all committee members. Most judges are appointed unanimously." Minister Shaked noted that committee work is based on professional considerations, saying that committee members are attuned to the issue of representation in Israeli society when looking for potential judges. "We took upon ourselves the task of locating suitable candidates and giving them priority in the screening process." "We appointed two female justices from Ethiopia and when we saw that there are almost no haredi judges, we issued a notice in haredi circles and gave priority to haredim so they too will be part of the judicial system. Judges in Israel must represent all citizens of Israel and this does not come at the expense of professionalism." Shaked was asked if she was trying to integrate Judea and Samaria residents and national religious judges into the judicial system, and she replied: "What I am careful about - and it is the right thing to do - is to definitely want judges with a conservative worldview. It is not the political 'right or left'. Professor Daniel Friedman, if you read his articles, is politically left, but he represents a conservative judicial mindset and if he was of suitable age, I would be happy to see him in the Supreme Court. I don't keep score of 'settlers' or religious people." "In the past 20 years, judges have been involved in political matters, especially the Supreme Court," she said. "There are things about which the Court should say, 'I don't intervene - it's a political matter,' and unfortunately they're not doing this." "There are two worrisome processes - the adjudication of the political world and politicization of the judicial world, and it happened because the Supreme Court adjudicates nearly every petition it receives. In England there's a committee of three justices in the Supreme Court who reject 75 percent of the petitions." Shaked does not seem worried about criticism leveled against her. "I was elected to change the existing situation and I make the moves that are required of me, and if I moved the cheese a bit, it's just fine," she said. The Justice Minister also referred to the Recommendations Law approved this morning by the Ministerial Committee on Legislation, forbidding the police from publishing its recommendations at the close of an investigation. "The Recommendations Law passed with my consent," explained Shaked. "In cases accompanied by the State Attorney's Office, the Attorney General and the State Attorney do not need the bottom line in the case. They know the file and therefore these recommendations are intended primarily for the media and the public." According to her, the Law seeks to prevent a situation in which a person "walks around with a cloud of alleged guilt over his head" after the police recommend that he be tried, and a year later, the State Attorney closes the file. "It's also a matter of human rights. Suspects also have rights." "As Justice Minister, I worked with the Prosecutor and the Attorney General in order to improve the Law so as not to harm the law enforcement system. We reached a balanced formula that doesn't fundamentally change the reality today. After the Law passes, you'll see that it's not the end of the world, and the police will continue to work together with the State Prosecutor's Office," Shaked said. The Justice Minister also referred to the investigation of Breaking the Silence Spokesman Dean Issacharoff, who admitted that he lied when he claimed he'd beaten an Arab during his military service in Hevron. "If a 'settler' bragged that he had beaten a Palestinian, would a complaint be filed against him that the police would fail to investigate? The same should be said of a human rights activist. If a person says he hit someone, it's something that needs to be investigated." According to Shaked, the media communicates with Breaking the Silence and not the State Prosecutor's Office. "It's much easier for them to identify with that narrative." She attacked the organization's activity and said, "They tour Hevron and say IDF soldiers break into Palestinian houses and watch soccer. The average IDF soldier does not do this. They exaggerate and inflate in order to blacken IDF soldiers and the State of Israel." Minister Shaked detailed the Jewish Home Party's political platform and did not seem worried about the specter of a bi-national state. "The State of Israel is Jewish and modern and will remain that way. The Arab public is increasing, but the birth rate of Jews and Palestinian Arabs in Israel is the same. So it's not that the demographic gap will increase. We don't think we should annex all of Judea and Samaria; we don't think we can live together in the same country." "It's possible to annex Area C, half a million Jews and [less than] a hundred thousand Palestinians, the State of Israel can afford to give them full rights. Areas A, B, Gaza, and Jordan will create a confederation. We need out-of-the-box solutions that might seem impractical, but if a solution is correct we must insist on implementing it. We have already carried out one test in Gaza, we withdrew and in return received missiles, tunnels, and an Iranian branch in the south near Ashkelon and Ashdod." "The current situation, even if far from perfect, is far better than a situation in which Israel withdraws from territories and gets another terrorist state there." Minister Shaked was asked whether she intends to run against Bennett as head of the Jewish Home Party. "Bennett's doing an excellent job, and together we bring the whole party to impressive achievements." "This coalition is very stable. In the cabinet this morning we all party leaders met and we all sat together with Deri, Kahlon, and Liberman, and everyone talked about a stable and strong coalition. If you ask me, elections will be in 2019. We have a lot of time left to work."